Explanation, suggestions, and guidelines for all the steps right from the selection of a site to the construction of the house and of location and positions of the rooms and house is found in Vaastu Shastra. Ancient culture and scriptures guide us to plan and build a house, temple or even town with all required amenities for the benefit and comfort of mankind. 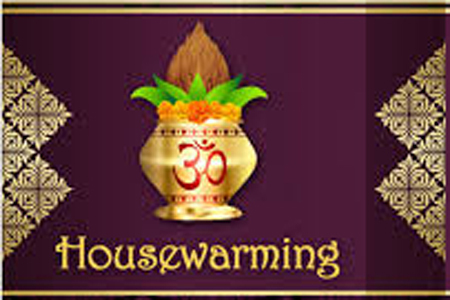 One of the most important occasions for the newly built house is a ceremony of Housewarming i.e. Griha Pravesh. Once the house is ready, the owner with his family moves to the new house by performing a housewarming ceremony. It is also an occasion for the hosts to present their new home to their relatives and friends. Apoorva: This is for a newly constructed house. It is the first entry to a newly constructed house. This is called Apoorva Griha Pravesh. Sapoorva: This is for an already existing house. When traveling abroad for a long time or migrating somewhere else is called a Sapoorva Griha Pravesh. Dwandwah: This kind of Griha Pravesh is for an entry into a house to after reconstruction or renovation on account of damage by fire, flood waters, electricity, wind etc. Following a few mentioned important points should be considered while moving into a new house. If not followed, they can bring obstacles and miseries to the occupant and his family. Therefore, living in a new house should be considered only after all important rituals are complete as per the procedure is given in the ancient scriptures. The priests have been offered a feast. House-warming ceremony should not be performed when the lady of the house is pregnant. Two important ceremonies are to be performed during the Griha Pravesh i.e. Vastu pooja and Vastu Shanti. These two poojas are essential. Once the house-warming ceremony has been performed and completed, the family can then move into the house. It has been suggested that the house should not be locked for minimum three days since that would be considered inauspicious.